RHP Seth Rosin to temporary inactive list, personal. INF Tyler Pastornicky acquired by Philadelphia, from Texas, in exchange for piles of cash, assigned to Lehigh Valley IronPigs. INF Devin Lohman assigned to Reading, from Lehigh Valley. Infielder Cord Phelps left the game early on Sunday. I didn’t hear the nature of the lineup move, but one would assume an injury. However, he was not added to the DL–which is only 7 days in the minors–which kind of signifies that he’s OK, for now. Meanwhile, infielders KC Serna–whom I really liked in Reading–and Devin Lohman have been struggling. Even in the field, neither has been sharp, and Lohman drew the short straw that earned him a trip back to Reading. The Reading team doesn’t have any particular depth in the middle infield, either, and top prospect JP Crawford will remain there through the Reading playoff push. Some on the interwebs yesterday surmised that the move to pick up Pastornicky–who has 124 games of MLB experience with the Braves–was in preparation for an Utley trade. But, while we cannot totally rule out an Utley trade, the lack of depth at AAA and AA was probably more the driving factor. If they should move Howard and continue with Utley at 1B, that would also necessitate some MLB middle infield depth. Either that, or one of the players who came over in the trade wanted his roommate back–or perhaps they just forgot to list him in the Hamels deal. I’m kidding, of course. I think they just saw the opportunity to add experienced depth, and while they usually care little about how well the AAA team is playing, I think the bolus of prospects in Reading plus the likelihood that they’ll be headed to the playoffs could have been a small factor. 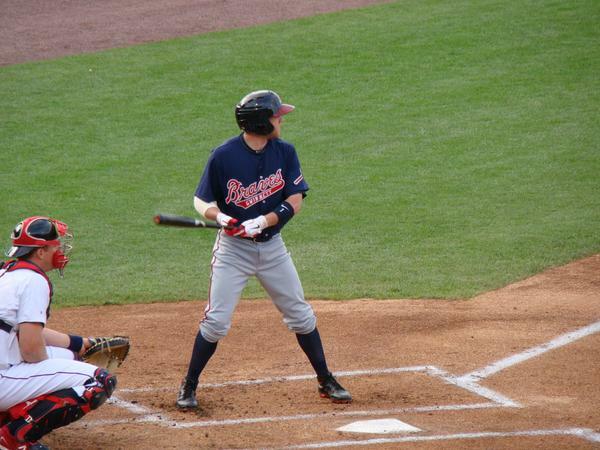 You should recognize the name Pastornicky, because we’ve been facing him with the Gwinnett team for the past four years. He’s a lifetime .280 hitter in the minors, and .243 in the majors. This season, he was hitting .283 in AAA, and spent some time in AA as well. He can play middle infield, 3B, and the corner outfield spots as needed, and bats from the right-hand side. However, the roster, the series in Syracuse, and the weather may have an impact. Following the weekend home series, the ‘Pigs will be off on Monday once again, and head to Moosic for a mid-week series with the RailMonkeys next week. I may be at a couple of those games, so give me a shout if you’re going up. 1. Tommy Joseph has been raking like crazy against the teenagers in the GCL as 1B/DH/3B. Could he return to AAA? Or push someone (Stassi?) from AA? 2. Russ Canzler could also return from the DL to fill those exact same positions. Stay tuned!